ReadWriteThink.org and the ALA website are great resources for Banned Books Week (Sept 24-Oct 1st). And so begins the first meeting between two of the most famous characters in 20th century children’s literature, Wilbur and Charlotte. 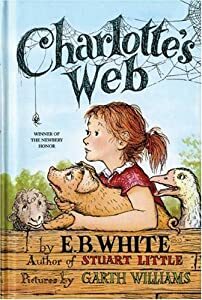 I am a great admirer of E. B. White’s work, and Charlotte’s Web is one of my favorite children’s books. Today I caught part of a wonderful interview with Michael Sims’ about his new book, The Story of Charlotte’s Web: E. B. White’s Eccentric Life in Nature and the Birth of an American Classic. The interview is on NPR’s Talk of the Nation. The book was released June 7, 2011 and is already in its third printing. There are links to more interviews on the author’s website, michaelsimsbooks.com, and I enjoyed reading the insightful article about the book at Smithsonian.com. I often use Charlotte’s Web in writing workshops with older students (2nd-5th grades) because the plot of the book is a perfect example of a “Hero’s Journey.” I use three questions to begin the discussion. The answers to these questions help define the beginning, middle, and end of the book. Many students will name Charlotte as the hero, but she is a supporting character I like to call, “the Teacher Character,” because she helps the hero the most on his journey. Wilbur is the hero because he wants something, but he won’t achieve his goal until the end. What does the hero want? Wilbur wants to live. This is the hero’s goal, and it determines the end of the book. In Charlotte’s Web, Wilbur wants to live, and several supporting characters help make his dream a reality as the story unfolds. What is the problem, or why is Wilbur’s life in danger? Fern’s uncle, Mr. Zuckerman, wants to eat him! Several supporting characters, including Charlotte and Templeton the rat, help Wilbur convince Mr. Zuckerman that he is “SOME PIG” and way too “TERRIFIC” to eat. 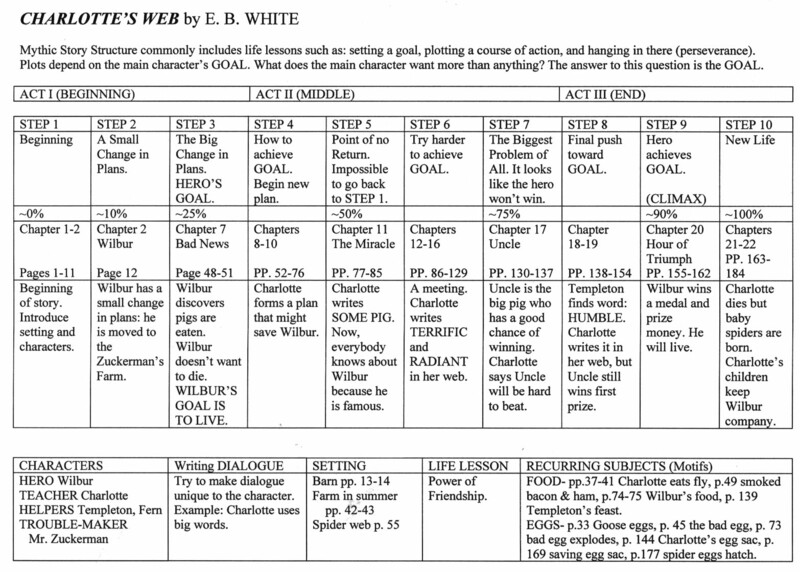 Below is an outline I created of the plot in Charlotte’s Web. Teachers, feel free to use this outline in the classroom. It’s a great tool for readers and writers. Seeing how the story unfolds, step-by-step, might help you outline the plot in your own story. Double-click to view and print the full page.